What is my diagnosis (the medical name for the illness I have) and what does that mean? Are there other treatment options? What are they? What benefits would you expect from the recommended treatments and other options? What are the risks or complications of the recommended treatment and the other treatment options? Are there problems or side effects that may be caused by the treatments? What methods will be used to prevent or relieve these problems or side effects? What are the side effects of the treatment -- immediate, short-term, and long-term? How will having treatment affect my normal functions and everyday activities? How would not having treatment affect my normal functions and everyday activities? Myth and Reality - "...Before you start exploring this section of the site, you may find it helpful to confront some of the most common misperceptions about informed consent and clinical trials. Even if these do not represent your thinking about informed consent, they can serve as a helpful reminder of what the process is really about before you go through it. Myth: Informed consent is designed primarily to protect the legal interests of the research team. Reality: The purpose of the process is to protect you and other participants by providing access to information that can help you make an informed choice. It also is designed to make you aware of your rights as a participant. Myth: The most important part of this process is signing the informed consent document. Reality: Actually, the heart of this process is your ongoing interaction and discussions with the research team and other medical personnel–before, during, and after the trial. The document is designed to get this conversation started. Myth: My doctor knows best; he or she can tell me whether or not I should consent to participate. Reality: Your doctor is likely to be a valuable source of advice and information, but only you can make this decision. No one–not even medical experts–can predict whether a treatment, screening, prevention, or supportive care method under evaluation in a trial will prove successful. The informed consent process is designed to help you weigh all of the information and make the right choice for you or your child. Myth: Once I sign the consent form, I have to enroll and stay enrolled in the trial. Reality: That's not true. Even after you sign the form, you are free to change your mind and decide not to participate. You also have the right to leave a clinical trial at any time for any reason, without forfeiting access to other treatment. Myth: Medical personnel are busy, so I can't really expect them to keep me informed as the trial progresses or listen to my questions. Reality: The research team has a duty to keep you informed, make sure that you understand the information they provide, and answer your questions. If you ever feel that you are not getting what you need, do not hesitate to speak up. You will be given the name and phone number of a key contact person who can answer your questions throughout the course of the trial. Keep in mind that people like you are making this research possible through their willingness to participate (Conducting Clinical Trials). Informed consent is a phrase often used in law to indicate that the consent a person gives meets certain minimum standards. As a literal matter, in the absence of fraud, it is redundant. An informed consent can be said to have been given based upon a clear appreciation and understanding of the facts, implications, and future consequences of an action. In order to give informed consent, the individual concerned must have adequate reasoning faculties and be in possession of all relevant facts at the time consent is given. 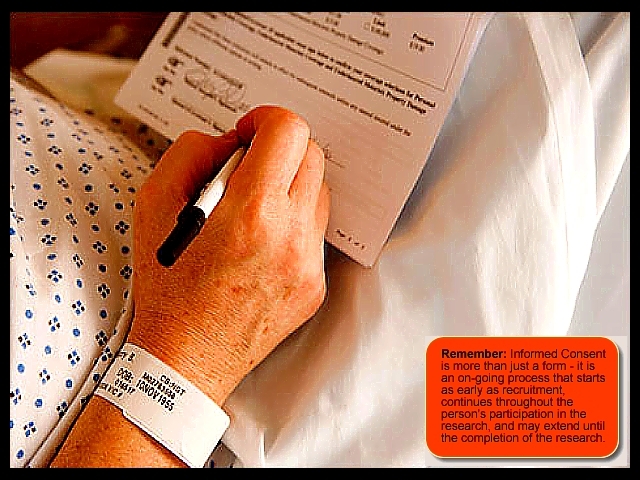 Impairments to reasoning and judgment which may make it impossible for someone to give informed consent include such factors as basic intellectual or emotional immaturity, high levels of stress such as PTSD or as severe mental retardation, severe mental illness, intoxication, severe sleep deprivation, Alzheimer's disease, or being in a coma. This term was first used in a 1957 medical malpractice case by Paul G. Gebhard. Some acts cannot legally take place because of a lack of informed consent. In cases where an individual is considered unable to give informed consent, another person is generally authorized to give consent on his behalf, e.g., parents or legal guardians of a child and caregivers for the mentally ill. However, if a severely injured person is brought to a hospital in an unconscious state and no-one is available to give informed consent, doctors will give whatever treatment is necessary to save their life (according to the Hippocratic oath), which might involve major surgery, e.g., amputation. In cases where an individual is provided insufficient information to form a reasoned decision, serious ethical issues arise. Such cases in a clinical trial in medical research are anticipated and prevented by an ethics committee or Institutional Review Board. ...Informed consent is also important in social research. For example in survey research, people need to give informed consent before they participate in the survey. In medical research the Nuremberg Code set a base international standard in 1947, and research proposals involving human subjects have developed since then. Most modern research is overseen by an ethics committee that also oversees the informed consent process (Wikepedia).